As we approach the end of 2012, I thought I’d get back to my theme for the year – Library Leadership. In order to be a great leader, a person must possess and demonstrate certain characteristics, or traits of leadership. Here are 10 that should be at the top of anyone’s list who is striving to become a great library leader. I have written before about library leaders needing to be visionary (Being “The Library” Again, Many 21st Century Library Directors Are NOT Librarians, and Go Big or Go Home!). That point can not be over emphasized. In today’s environment of constant change causing an ambiguous future, leaders must be able to create a vision and then share that vision with every member of their library. They must be able to persuade, teach, mentor, coach and “by force of example, talents, and/or qualities of character” play the primary directing role in the library while enlisting followers to make the dream a reality. Whenever someone thinks one member of the team is a super star, it’s best to remember that EVERY true leader requires followers, and not just followers, but individuals who can and will comprise a team. The most heavy lifting is done by a team. The best work is accomplished by a team that believes in the library and owns the vision. I suspect that life has shown us all that although we like to think we’re indispensable, once we’ve left an organization, life goes on and work continues in whatever new direction it will, doing quite well without us. A great leader will never miss the opportunity to show appreciation for someone’s efforts, and successes. The power of appreciation is strong, and as noted below, can be a strong motivator. Studies have shown that the number one reason why people leave an organization is lack of appreciation. It’s not money, it’s failure on the part of the leader to make the employee feel valued and recognized for the work they do. Criticism seems to be the easiest thing in the world to give, but encouragement is something a great leader does not have to work at doing. What motivates you? Probably many things, including a belief in what you do as something worth doing. Money? Sociologists suggest that money is not a motivator, but lack of it can be a de-motivator. Praise? Everyone likes praise, unless they believe it is given without sincerity. Hope? Concerning working in a library, the best motivation is the intrinsic value of the work itself. Great leaders recognize each employee’s motivators and tries to ensure that they fulfill those for all employees. Motivation takes many forms. Delegation is not the same as empowerment. Delegating authority to accomplish a job is routine and generally pertains to the specifics of that job. Empowerment means giving employees the authority to step outside their specific job duties to enable them to accomplish other tasks that are at the core of the organization’s values. For example, it would not be considered normal for a cataloger to be empowered to take steps to ensure the highest quality customer service. That is generally reserved to reference staff and youth services librarians and others who deal directly with the customer. But why shouldn’t every employee of the library be empowered to ensure that every customer is totally satisfied with their experience at the library in every respect? Great leaders not only delegate, but empower everyone to make the library more than it can ever be without their contributions. It has been relatively recent, maybe 20 years at most, that business and most other public endeavors have encouraged life-long learning as an important factor of success in today’s society. With the proliferation of technology our society has transitioned to a ‘trial and error’ method of learning. We learn to use technology by playing with it, using it to do whatever we think it will do, and learning how to make it work. However, the great leader is an active learner, seeking professional development opportunities, listening to people, especially employees, and assimilating knowledge for the purpose of becoming a better decision maker, and a better leader. Understanding the problem is essential to solving the problem. Identifying the problem correctly helps one narrow it to the point of being able to solve it, because we can usually see the solution if we can grasp the problem. How often have we heard something like – ‘That’s great, but you solved the wrong problem.’ – whether it was regarding a school math question, or taking care of business? Understanding the problem correctly is the key to solving any problem. And, here we see again, one of the qualities of leadership is solving problems before they get totally out of hand. Combine responsibility with problem solving and great leaders get things done! How often have you been faced with a problem that needed solving, but you either weren’t sure how to tackle it, or didn’t think you had time to tackle it right then, or for whatever reason just put it off. What usually happens? The problem gets worse. It never fails. Problems do not fix themselves, regardless of what some people say. It is true that ‘No decision is a decision.’ If you put something off long enough circumstances will decide for you, and often times that decision is not a desirable one. Life’s experience has shown most of us to address problems as soon as they are recognized, to prevent them from becoming much bigger, and to solve them sooner rather than later. Great leaders just do it! Responsibility is a fundamental human trait that allows organizations to function. Individuals who recognize a responsibility to do their best, as well as see what needs to be done and take responsibility to get it done, are the life’s blood of any library. Having a sense of responsibility motivates people to do the right things, it is the cause of much of the world’s successes, and lack of it the cause of much of the world’s problems. A great leader takes responsibility for everything his/her library does, or fails to do. No IF’s, AND’s or BUT’s about it. The buck stops at the library director’s desk. “I believe that every right implies a responsibility; every opportunity, an obligation; every possession, a duty.” John D. Rockefeller, Jr.
We all know that Jules Vern was a highly imaginative guy. But my bet is he took a few ideas from Leonardo De Vinci – the guy who envisioned the helicopter and parachute – in the middle ages. I think Walt Disney must have taken after them to create his magical kingdoms, and so many others must have also had vision to be able to create monumental dams and bridges, space ships, computers, artificial limbs, and medical marvels of all kinds. I suspect Vern was hoping that someone would achieve and make real what he only dreamed, and they did. A great leader has the vision that, with his/her leadership ability, will influence others to make real. Think about a situation in which you knew you could do something and no one would EVER know about it if you didn’t tell. Good or bad, doesn’t matter, your actions would never be found out. There would be no evidence of your actions linked to you. There would be no repercussions to you or anyone you knew. That’s not to say that your actions would have no impact on anyone, actions always have impact on someone or something, just no one you know who could trace your actions back to you. What would you do? The answer to this question is what constitutes a person’s character. Library leaders should be striving to be “great” leaders. It’s what the profession needs to flourish in the ambiguous future and regain the library’s relevance in the community. It is what’s needed for survival. The idea for this post was taken from an article by New York Times and Wall Street Journal Bestselling Author Shep Hyken. Librarian or Radical Social Activist? Last weekend began ALA’s Midwinter conference. Obviously, librarians (and others associated with the profession) got together to discuss the old and new topics of the profession – mostly old. But LIBRARYJOURNAL Online posted this on Saturday – ALA Midwinter 2012: Occupy Wall St. Librarians Wonder, When Did Sharing Become a Revolutionary Act? – about the Occupy Wall Street (OWS) librarian activists. The article reports on a panel discussion that was sponsored by the ALA Masters Series and “included the first OWS librarian”. Another of the panelists and OWS librarians, a very recent MSIS graduate, was cited in the article that “he characterized the librarians as continuing the fight for their beliefs” even though the library had basically been destroyed when the protest was broken up by New York City authorities. What concerns me are the apparent radical activist beliefs, motivations and perceptions of these librarians that inserted themselves into this “Occupy” movement, and affiliated a social protest movement with a “library” by using totally warped reasoning. My first questions are: Who assessed the need for (we’ll be generous and refer to their book collection and reading area as) a “library” for the protestors? Who decided that their OWS library was a “People’s Library”? What is a People’s Library? Is that a new category like Public, Academic, School, Special, etc.? Who decided this was a “library” in any sense of the term? If that was a “library”, let me show you my library that I carry in my brief case. That same panelist was also quoted as saying that; “I joined [the People’s Library] because building a library, any library, in times like these is an act of resistance, and protest, and hope, and love,”. ?????? SERIOUSLY? Resistance and protest against whom? Your local library Board? Your local town council for cutting the library’s budget so it can still provide police and fire protection, and teachers salaries? Protesting against the Library of Congress? Society in general because libraries are not more valued? PROTESTING AGAINST WHOM? And, since when did the mission of a library become social protest? In my opinion, these librarians are on the wrong track as far as what librarianship is all about, as well as the role of a library, and are simply acting out their frustrations toward society under the guise of librarianship. “… we are ready to produce a trained literary class” can only be interpreted as elitist librarians and their more elitist scholarly colleagues making the decision and plan as to how, what and who should be educated with books. We know that from the history of education in the US. Saying that “Librarianship has a long history as a liberating force in society,” is just not true. Librarians had a very elitist self perception not that many years ago, and it seems as though that pendulum is swinging back in that direction. As recently as 2007, George Needham is quoted as saying; “The librarian as information priest is as dead as Elvis.” The whole “gestalt” of the academic library has been set up like a church, Needham said, with various parts of a reading room acting like “the stations of the cross,” all leading up to the “altar of the reference desk,” where “you make supplication and if you are found worthy, you will be helped.” (When ‘Digital Natives’ Go to the Library, Inside Higher Ed., June 25, 2007.) If that is not a historical example of professional elitism, I’ve never heard one. If we concede that building a library – “any library” – would be great and a necessary act, it would only be revolutionary if there wasn’t one already! Last time I heard the NYC Public Library, and its 70 something branches, is still up and running stronger than ever. How far away was the closest NYCPL branch – 2 or 3 blocks? Who knows whether the books that were retrieved from the NYPD after the protestors were cleared out were even usable before the OWS protestors were cleared out? Does anyone really believe the NYPD wants 3,000 paperback books? Talk about self-centered! Does this person seriously expect anyone to believe that the New York police department was targeting the “library”? These librarians want to bizarrely take up a mantel of persecution upon themselves and their cause – whatever that may be but which is totally separate from the OWS cause – simply by affiliating their “library” with an illegal protest movement. An “all-out assault on what libraries stand for and what they do” – SERIOUSLY? I can’t help but wonder if this person even knows what libraries stand for and do. I’m very concerned about this radical activist role that new librarianship seems to be taking upon itself. It is not the role of the librarian. It does a disservice to our profession to have radical activist librarians making hysterical vague and patently untrue claims about societal assaults on libraries. Librarian or Radical Social Activist – which one did you get into the profession to be? 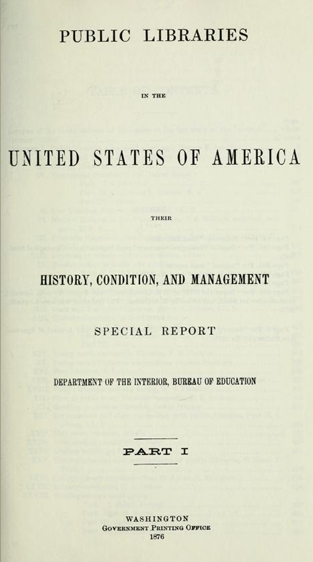 As I was browsing through some library literature, I found myself confronted with The 1876 Special Report of Public Libraries in the United States of America, published by Department of The Interior, Bureau of Education, U.S. Government. If you’ve been through a MLIS program you’ve no doubt heard of it, but I’m curious if anyone has ever read it. It’s quite interesting, and I think its contents should put our librarianship profession in a very self-aware perspective, which I’ll explain later. So far as ordinary readers are concerned, the printed records of past and present human knowledge and mental activity are thus a trackless, if not a howling wilderness, in which a guide, philosopher, and friend will find ample occasion for his services. The matter of reading is at present in a wholly unorganized, unscientific, empirical condition, like navigation before the use of the compass and the application of scientific astronomy, or like mining before the introduction of scientific geological and mineralogical investigations and of scientific engineering. Every one digs wherever he fancies; he may possibly find a deposit of gold, but he may find only mere barren rock or slag or dirt. Perhaps it may be still more aptly compared with the physician’s profession, in which famous and successful practitioners begin their lectures by saying, “Medicine, gentlemen, is something that physicians know nothing about,” and in which an advertising quack, whatever his effect on the graveyard, will sell a great many more doses to fools, and make a great deal more money out of them, than a conscientious and scientific gentlemen in treating people of good sense. America’s society in general and librarianship specifically, has progressed on this premise for over 100 years. It was the right emphasis at the right time in history and social development of a new nation. It was also the root from which library schools, and eventually a librarian “profession” sprang. It was quite adequate until the 21st Century. That was when the efforts of an army of catalogers and electronic data experts made complete and total organization of that “howling wilderness”; at least as far as concerns organizing that “wholly unorganized, unscientific, empirical condition, like navigation before the use of the compass and the application of scientific astronomy….” world of information. As a result, this role of the librarian as the “guide, philosopher, and friend” is obsolete, or will be in the very near future. One can justifiably ask – Is the librarian obsolete? At a minimum, librarians must find a new mission – a new purpose for being. I think everyone agrees that this sacrosanct role of academic reference librarian has gone with the last century, just as other traditional librarian roles are going away, and for essentially the same reasons. Librarians for too long have taken the “gate keeper” / “guide, philosopher, and friend” role too literally. And, although there seems to be no source for the attribution to Melvil Dewey that; “The librarian must be the librarian militant before he can be the librarian triumphant.”, my personal opinion is that, if Dewey said that, he was operating from the same premise expressed in the 1876 Report, and that “library militant” referred to dictating what people should read, along with an abundant amount of SHUSHing! Neither of which are compatible with 21st Century librarianship. As mentioned above, the librarian – the “professor… of books and reading” – (even though they took ages to emerge despite their necessity 100 years ago), is now essentially obsolete, in the sense that The Special Report proposed. Isn’t that appropriate? Doesn’t everything have its season? Isn’t the era when people needed someone with “the knowledge of what to read and how to read it” over? Once youth are taught this information literacy skill in school, during which time adults out of school can also be taught information literacy, then the time for that role of “gate keeper” / “guide, philosopher, and friend” librarian will also end, whether it was ever appropriate or not. This philosophy to be sure is out dated. Not until the adoption of the common school system of public education did every man, and woman eventually, have the opportunity to learn from those more educated than they. But the model was still “the reading of certain books which the common sense of all scholars agrees will represent the science already accumulated”. Even though the author’s observation that “The greatest genius is he who consumes the most knowledge and converts it into mind.” may be a universal truth, the mode of achieving that has drastically changed in over 100 years, and the definition of knowledge has expanded to include discovery in all its many forms. We recognize now that the engaged student learns better than the previously lectured to student. While the school librarian, or teacher-librarian, still has a vital role in developing information literacy in youth, where does this leave the public librarian? In my estimation, teaching literacy has not been a role of the public librarian for decades, if not longer, and certainly not literacy in the sense that they provided patrons with “the knowledge of what to read and how to read it”. While public librarians may often be asked to recommend a “good book”, that is not what “what to read and how to read it” meant in 1876. It literally meant that the average citizen was not smart enough to know what they should read to gain the right kind of knowledge, nor were they smart enough to know how to read it to gain that knowledge – therefore the librarian had the calling to educate those poor illiterate people. Hopefully no librarian today would adopt that self-important, ego inflated opinion of their purpose. What shall the public library do for the young, and how? is a question of acknowledged importance. The remarkable development of “juvenile literature” testifies to the growing importance of this portion of the community in the eyes of book producers, while the character of much of this literature, which is now almost thrust into the hands of youth, is such as to excite grave doubts as to its being of any service, intellectual or moral. 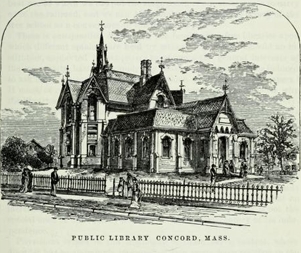 In this state of things the public library is looked to by some with hope, and by others with fear, according as its management is apparently such as to draw young readers away from merely frivolous reading, or to make such reading more accessible and encourage them in the use of it; hence the importance of a judicious administration of the library in this regard. Which, brings me back to the self-aware perspective of our profession today. Public librarianship is about helping people fulfill their information needs, not in deciding what should be read, or how. Today’s overriding concept of librarianship is customer needs driven – the total opposite of the 1876 perspective. The concepts of the 21st Century librarian below are so foreign to the thinking 100 years ago as to be perceived as total lunacy then. “1) The 21st Century librarian is both a user and producer of technology to better understand and achieve improved library services. 2) The 21st Century librarian is a master of information literacy who relies on that skill to enhance advanced reference services. 3) The 21st Century librarian understands ALL types of information resources and relies on that knowledge to select the BEST resource for the customer’s information needs. 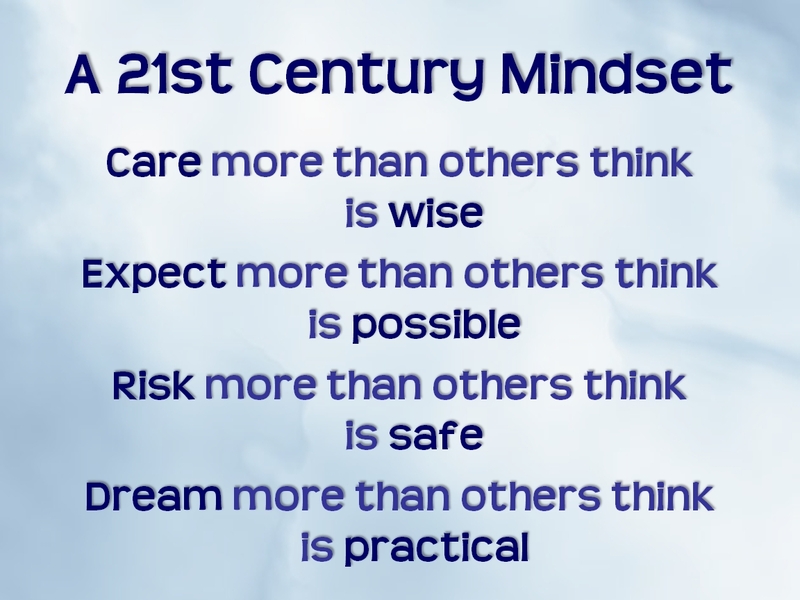 Last April I published the brief outline of what I called a 21st Century Mindset. It included simply the following four actions. It is one of those catchphrase things that is intended to inspire. I have it hanging close by my desk, and look at it often. When accomplished with heart, purpose, courage, imagination, determination and will, it makes a difference. It will take all of those characteristics and more for librarians to achieve their 21st Century Library. A 21st Century Librarian is more caring. They care more than others think is wise about the library’s customers, and about every customer’s library experience, because they know how vital it is to instill that loyalty to customers if we expect their loyalty in return. They care more about their role within the library, and the library’s role within the community, because that is how the library will survive – through having a relevant role within the community. They care more about their professional development, and about their profession, because they know the challenges ahead are new and daunting. They care more about preserving their library than others think is wise, because it is hard to manage the future and the challenges ahead for libraries. But, just stop to imagine the alternative to not caring more. It has long been accepted that children will rise to the level of learning that they understand is expected of them, at least that is what educators have finally figured out. The same principal is applicable to athletes, and generally every type of performance. The same is true of librarians. We should expect more of ourselves and each other than others think is possible, because that is how we will achieve great things within our libraries. THAT is how we preserve our libraries! Do your library customers expect to be ignored when they walk in the doors, because you’re too busy with some housekeeping chore? Do your teens expect to be quieted if they get too loud, because you think libraries are quiet places? Do your colleagues expect to be inspired by you to achieve excellent performance? Do you expect more of yourself than others think is possible? Risk is a risky business. There is recklessness on one end, and there is educated risk on the other. Some people never risk anything, because they prefer to hold on to what they think they have rather than lose it. There is a longer poem about Achievement that ends “At length some feet shall stand, On heights yet unattained. Why not thine own? Press on, achieve, achieve.” We seldom know what we can accomplish until we apply our talents with determination. History is filled with accounts of people who beat the odds against them and accomplished great things. Every great thing began with a dream, or vision of what could be. Senator Edward Kennedy eulogized his brother Robert by saying; “As he said many times, in many parts of this nation, to those he touched and who sought to touch him: ’Some men see things as they are and say why. I dream things that never were and say why not.’” What is your dream for your 21st Century Library? What do the actions in this Mindset mean to you?